Get to know the 45-year old actress Christiane Paul, before she got famous (e.g. Die Welle (2008), Im Juli (2000) & Das Leben ist eine Baustelle. (1997).). IMDB reports Sabine Christiansen (TV Series) was Christiane Paul's first TV appearance in 1999. Her home town is Berlin-Pankow, East Germany. 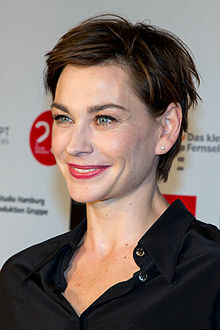 She is of German ethnicity. Christiane Paul was born on March 8, 1974 on a Friday. Share your real life experiences with Christiane Paul here and rate your meeting! Correct our wiki/bio - is she not gay or straight or of different heritage? Let us know!